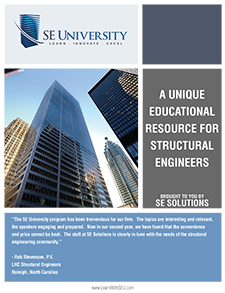 Have you reviewed the newest changes to the seismic provisions in ASCE 7-16? Even for engineers who do not typically practice in high seismic areas, the changes may affect your site class, geotechnical requirements, and analysis procedure. In December 2018, John Hooper, PE, SE, from Magnusson Klemencic Associates, gave a presentation on Updates to the Seismic Provisions in ASCE 7-16. John covered the technical changes to the seismic provisions and explained the basis for these changes. Changes were made throughout the provisions, however the updates within Chapter 11 may affect the most engineers nationwide. Since the the last update in 1994, thousands of new seismic data points were added which have resulted in new, more accurate site amplification factors. These factors range from 80%-120% of the previous Fa and Fv factors depending on location. Since the Fa factors have changed, Site Class D is no longer the default site class. Now, the default site class is a blend of Site Class C and D. This could be a significant change depending on your region. 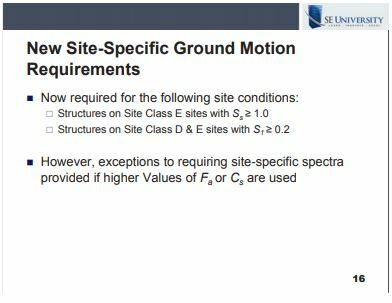 Also, new site specific ground motion requirements have been included in Chapter 11.4.8. These additional requirements help prevent potentially unconservative results in sites with high seismic activity and softer soils. The following slide shows which circumstances require the new site specific spectra. There are some exceptions allowed for having to develop the site specific spectra as shown in the following slide. These additional site specific ground motion requirements may increase your geotechnical costs for the project. Using the exceptions noted on the slide above can help avoid these increased geotechnical costs, however using the exceptions may increase your base shear and member sizes. This will be an important consideration for sites within these areas. 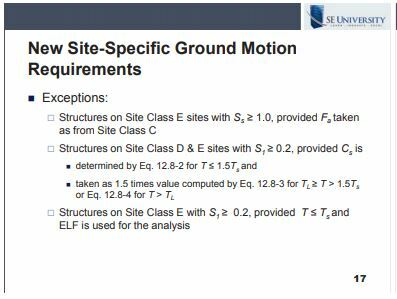 Also in Chapter 11.9 are new vertical ground motions available which can be used in lieu of Chapter 12.4.2.2 for Seismic Design Categories C-F. Overall the most significant changes affecting most engineers in Chapter 11 are the site amplification factors. Be sure to note these new values and possible additional site specific ground motion requirements that could result in ASCE 7-16. As always, the Commentary offers additional insight to changes made within the Standard, so be sure to check there for further clarification, if needed.